For couples who really want to take the plunge into married life, they can have a skydiving wedding. Small planes carrying skydiving passengers take off from Las Vegas Airport most days. 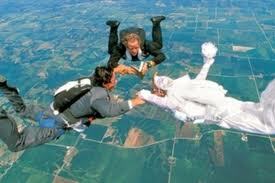 There are several skydiving wedding options available. One is to have your ceremony on the ground before you go up in the plane. You wedding guests can watch you take off, then they will be taken out to the dropzone viewing area to witness the couple’s entry into matrimony on solid ground. Another option is to do the jump, then have the ceremony once you have landed and the adrenaline is still pumping. Vegas Extreme Skydiving has a skydiving preacher who performs ceremonies on a plane as it ascends to jump altitude. Once the couple are married, they jump out of the plane. Again, guests can be waiting for their arrival in the ground. Complete packages start at $1299. Some packages include flowers for the bride and champagne for all the guests. All skydives come with a DVD of the whole experience, including the dive itself. Photography is an optional extra. This entry was posted in Las Vegas, weddings and tagged Las Vegas skydiving, Las Vegas wedding, skydiving, skydiving wedding, wedding. Bookmark the permalink.